Nottingham has more vacant shop space than any other large centre in the UK, new figures suggest. The vacancy rate increased over 12 months from 23.1% to 30.6%, according to a report by the Local Data Company. LDC counted shop units in the area defined as Nottingham's "retail core", which includes areas outside of the city centre. Nottingham City Council's own survey of the city centre put the vacancy rate at 17.4% last October. Councillor Nick McDonald, the council's portfolio holder for employment, skills and business, said: "The figures in this survey are not an accurate description of city centre vacancy rates in Nottingham, suggesting as they do that almost one in three shops are empty. If you walk around the city centre you can see that just isn't the case. "In fact new shops have been opening up in Nottingham and Nottingham still has the fifth highest retail spend outside London." LDC gathered the data by visiting 145,000 shops in Britain between January and June 2012, including those in large centres, medium centres, small centres, shopping centres and retail parks. An average of 14.6% of the retail units were empty. The researchers counted shop premises in the area defined as the "retail cores" by the Department for Communities and Local Government. In Nottingham, this reaches into the area around Sneinton Market to the east, and parts of Radford to the north-west - both areas outside of the city centre. To the north, the retail core includes shops on Mansfield Road and Huntingdon Street, north of the Victoria Centre. "Our own city centre survey of retail units from last October shows a vacancy rate of 17.4% which is in line with the national average," said Mr McDonald. He said vacant shops were a national problem which reflected wider economic problems, but the city council had a number of big projects to boost retail performance. LDC said online sales and a dramatic drop in consumer spending were partly to blame for high vacancy rates nationally. 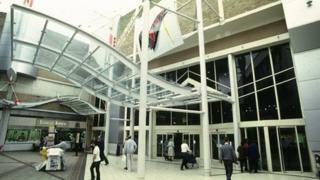 But it said the problem had been exacerbated by the growth in the volume of retail space.